The Moroccan Agency of International Cooperation (AMCI) and the United Nations Office for South-South Cooperation (UNOSSC), have signed a memorandum of understanding (MoU) to promote South-South cooperation in Africa. Morocco, a founding member of the African Union has made South-South cooperation an instrument for the advent of a new Africa that believes in its potential. The MoU between AMCI and UNOSSC was signed on the sidelines of the 73rd United Nations General Assembly, which is currently held in New York. The agreement lays the foundations for deeper cooperation between these two institutions, for the promotion of South-South cooperation, particularly for the African continent. 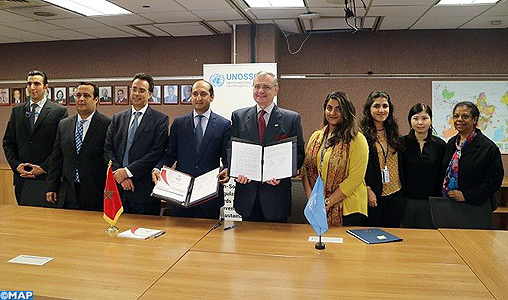 According to Mohamed Methqal, the Director General of AMCI who signed the agreement on behalf of the Moroccan government, the MoU will facilitate the partnership between the Moroccan Agency and the UN Office with the aim of developing joint actions on the continent. The signing of this important memorandum crowns the multidimensional work of the Kingdom of Morocco in Africa under the leadership of King Mohammed VI. Established in 1986, AMCI represents a versatile implementation tool of cooperation outlined by the Moroccan government within the framework of South-South cooperation. It places the human element as a main focus of its development strategy. Posted by Emmanuel Agbenonwossi on September 28, 2018. Filed under Zoom. You can follow any responses to this entry through the RSS 2.0. Both comments and pings are currently closed.